Secured with Nightize wire gear ties aft (two dedicated nylon eyestraps tapped and bolted to top of aft akas) and ball shock cord around the tramps forward. No movement, very little flex because my full weight needs to be on the aft aka to keep the nose up once it's windy enough to sit outboard. These weigh about 8.5 pounds each and cost $75. They store cross wise on the trailer and don't stick out far enough to be any issue. 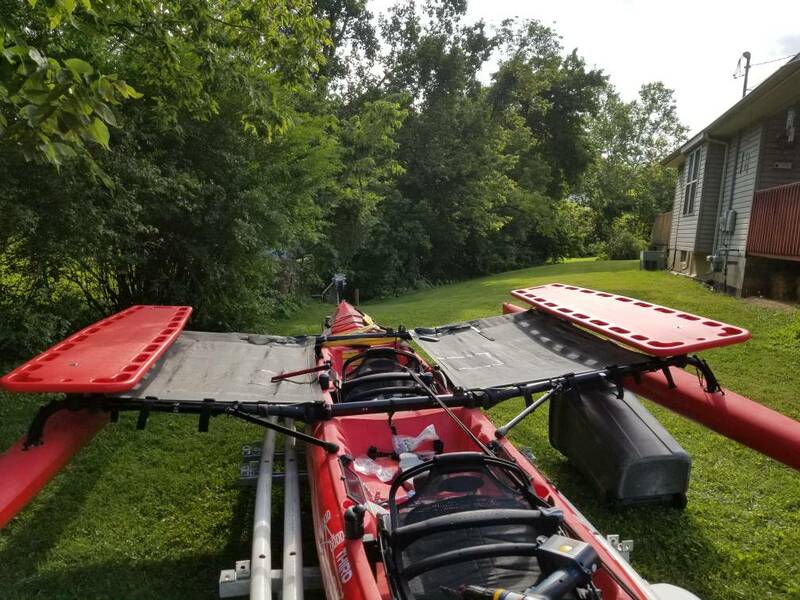 When I launch from a dock, I just rig one side with two hakas stacked, and then move the extra to the other side once the akas unfold. Seen here heading south toward Catawba Island from South Bass Island (lighthouse to port) on Lake Erie. The hakas add a nice dimension to the boat for some missions. Excellent concept. 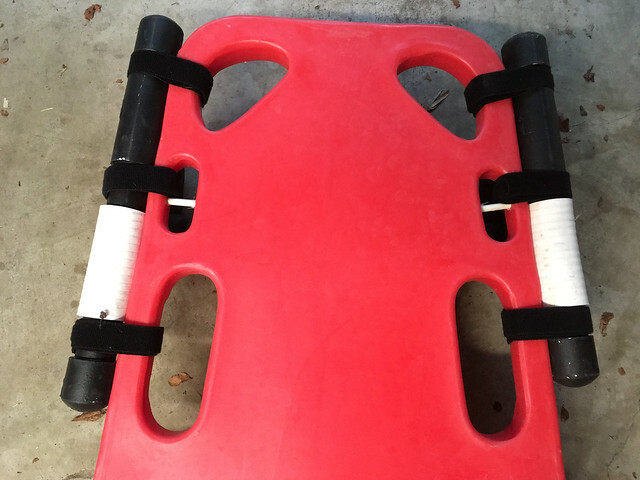 I made a prototype to attach one of my spine boards over a trampoline using 1" PVC and 90 degree elbows. 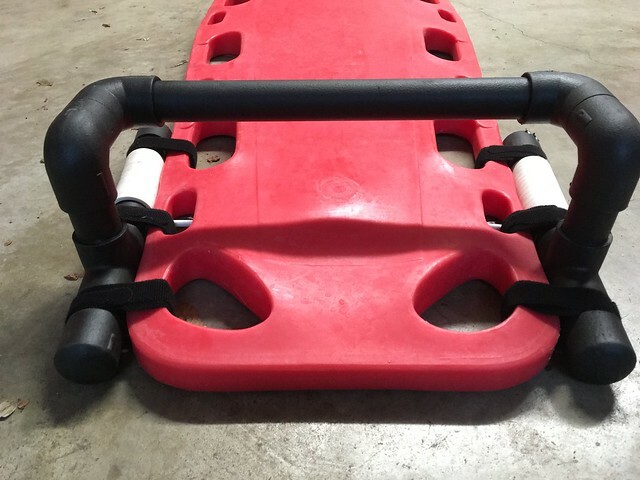 I'll try to post a pic of it later but basically it's a wide hook the width of the front end of the spine board that goes around the aka and straddles the spine board on the top side. Because the spine board narrows at the front I glued the top side 90's to allow the straight attachment pieces to follow that shape. 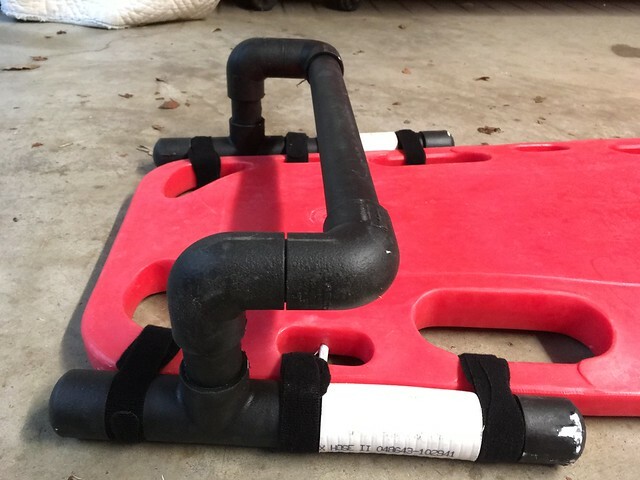 I just attached it to the spineboard with velcro straps and put a piece of spaflex tubing over the aka and tramp to protect the tramp from abrasion. At the stern I use a two foot strap looped through both sides of the spine board and around the aka. As you have probably realized the loop of trampoline fabric around the aka at the bow makes it problematic to attach a haka easily. My intent was to try out the pvc one and then bend or weld something out of stainless or aluminum tubing later if it worked out. The spaflex tubing is slightly tacky and does a pretty good job of helping to keep the spineboard in place at the bow. I just leave the pvc piece attached to the spine board and the velcro seems to hold it very well. Last edited by Buckaroo on Fri Aug 11, 2017 3:58 pm, edited 1 time in total. Im diggin all the spineboards you all are using. I hope i can find/afford a set when my wood hakas either need replaced or rot away. The spine-board solution is (imo) the best - tough, light, easy to transport, etc, etc. I just wish there was somewhere in Australia where I could get them for 75 bucks! 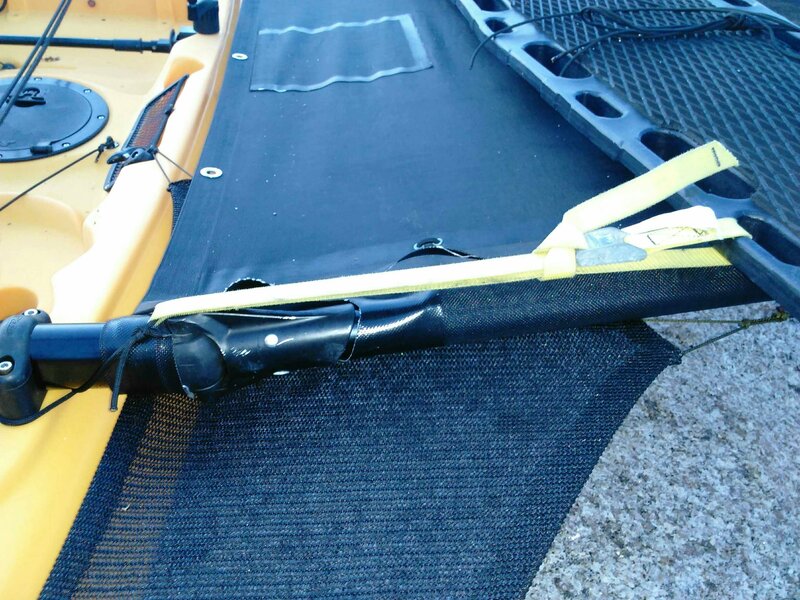 For mount options checkout what Hobie did for the spinnaker snuffer bag. Basically a half pipe fits over the front aka/tramp and two long quick release straps run under the tramp, back up and over the rear aka, clipped back to the board and tensioned. I wonder if anyone has tried making HAKA's from PVC tubing, the stuff is very inexpensive. I am thinking 4 parallel bars around 6ft long about 3" between each bar, with T's on the ends in the middle bars and elbows in the outer corners. 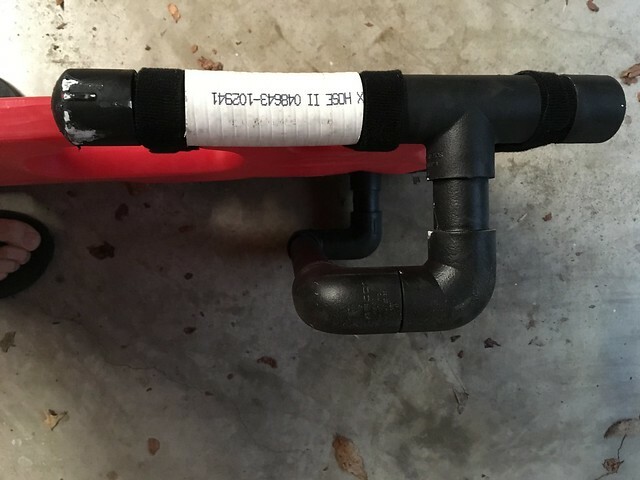 I think either 1 inch or 1 1/8 schedule 40 PVC ( or some larger schedule 80 pvc) will just fit wood broom handles into the tubing, (I used wood broom handles in my trailer cradles slid inside PVC). The wood is completely sealed within the pvc so it won't rot and is incredibly strong (compared to just pvc, because of the grain of the wood which is trapped inside the pvc so it can't splinter). Basically to make it you would slide the broom handles into the 4 long tubes so the ends stick out slightly. Then completely assemble and glue each end with two elbows and two T's. Just prior to assembling the ends to the rods you would place the ends upright and pour fiberglass resin into each end piece (nearly filling it), then shove all the rods in, (I used this method to make my PVC motor mounts). I haven't tried it but I would think this structure should hold someones weight. Then to finish off go to walmart and get several white polyethylene cutting boards ( I think around $3 to $4 bucks ea), the drill and screw the cutting boards down to the frame. Or just buy a 4' by 8' sheet of 3/16" or 1/4" polyethylene plastic sheeting ( if you can find it), rip it to the right size and screw it all down to the top surface of the frame with stainless screws. You could the use a hole saw to make several holes and slots in the shheting for hand holds, and slots (mostly to shed excess weight). I suppose you could use black pvc if you can find it, or even electrical PVC tubing (which is a little stronger I think). 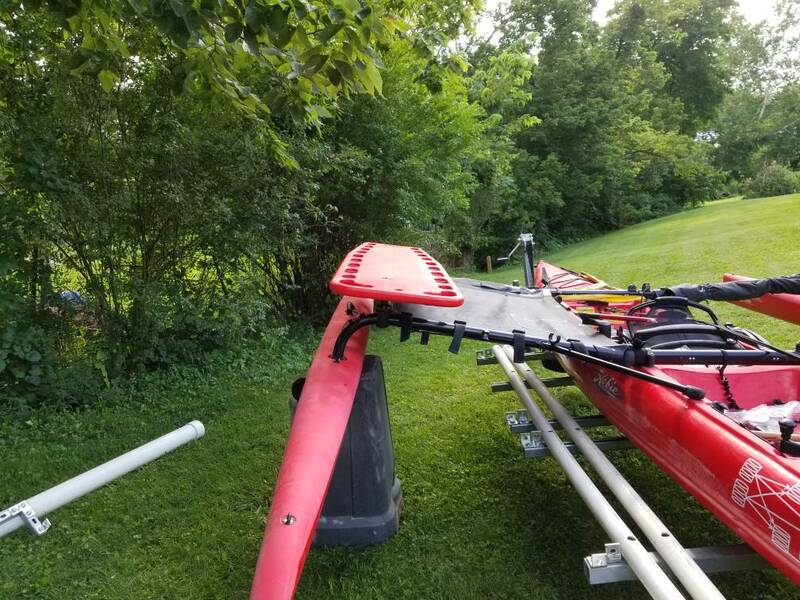 I've been thinkin on this one for a while and based on the proven strength of my 7yr old PVC motor mounts, and the PVC cradles on my trailer, this might be a viable construction option. I have no idea what the things would weigh, or how strong they would be. But it might be a way to make a HAKA set without having all the wood working tools and skills. I wouldn't think it would take more than a couple hrs to make with just a hack saw and power drill, I'm thinkin maybe $50 bucks in materials. I suppose I would just bungy the things to my AKA bars. Since my TI is now widened, (I extended my AKA bars about 1 ft per side), there is a foot or so of AKA bar area out past my tramps screaming at me to add HAKA's. I would be interested to hear if anyone has tried anything like this, and if it worked or not. I won't attempt if all you HAKA guys think it's the stupidest idea you ever heard of. These boards also make perfect no-mod motor mounts for the excellent Watersnake 24LB thrust motor. Something most interesting about the Mirage Drive is that when motoring, if you just tick the pedals over with barely any effort, the speed jumps dramatically as the drag of the fins is turned to thrust. 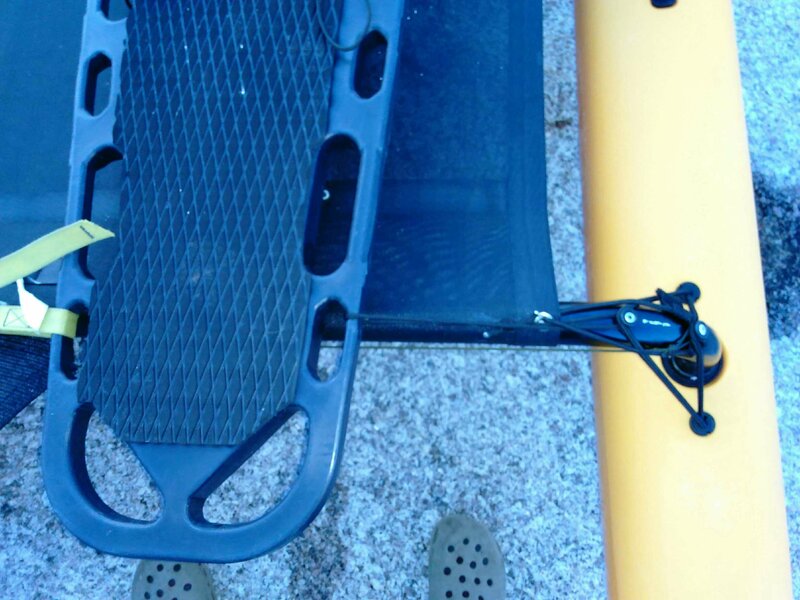 Just idling the pedals in low-mode on the 12v Watersnake it gives 2.4 knots @ about 11 amps. These boards come in Yellow that looks Papaya to my old eye . Your setup looks grate!! I have been reading the beanch seat thread and this option to use spine bosrd seems by far the best option so I am considering the same sollution. A bit pricy... in Europe the cheepest board I can find is around $200. The spline boards weigh around 6-7 kg so its a bit on the heavy side bur I cant find a better option that is also easy to install and looks grate. The sweet spot for solo sailing the TI hiked out is just aft of the rear aka. To achieve this haka need to be 2m (79") long. 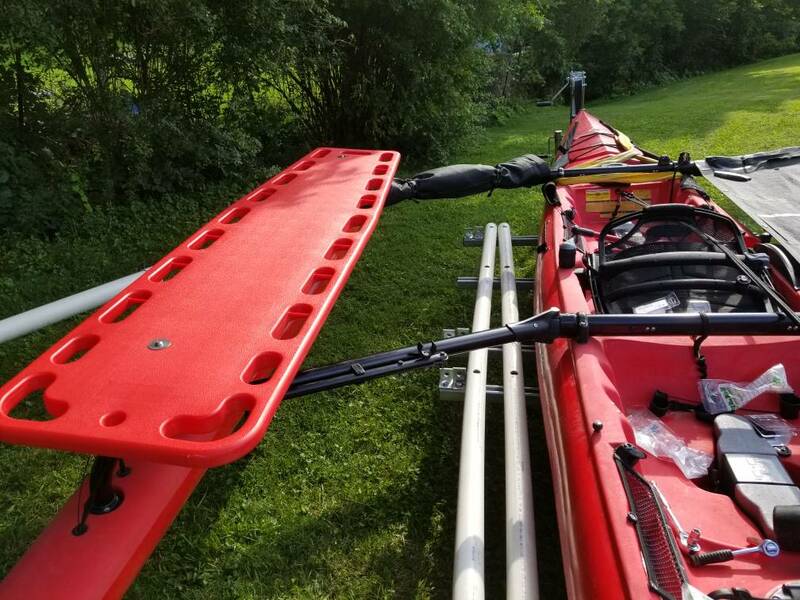 A 72" spine board is too short for the TI IMO. Cantilevered to about the brace ball makes it easy to swap from seat to haka. I am happy to hear that I will have good use of my 3rd extra aka. Sailing hiked out is a lot of fun and going solo on a TI hiking out is frankly often necessery if you dont want to furle. I was thinking about mounting a longer bracket on the spineboard so it reaches all the way down to the 3rd aka. Also takes some of the load of the end of the spline board that hangs out behind the second aka. The one I am thinking of buing is just 183 cm (72"). 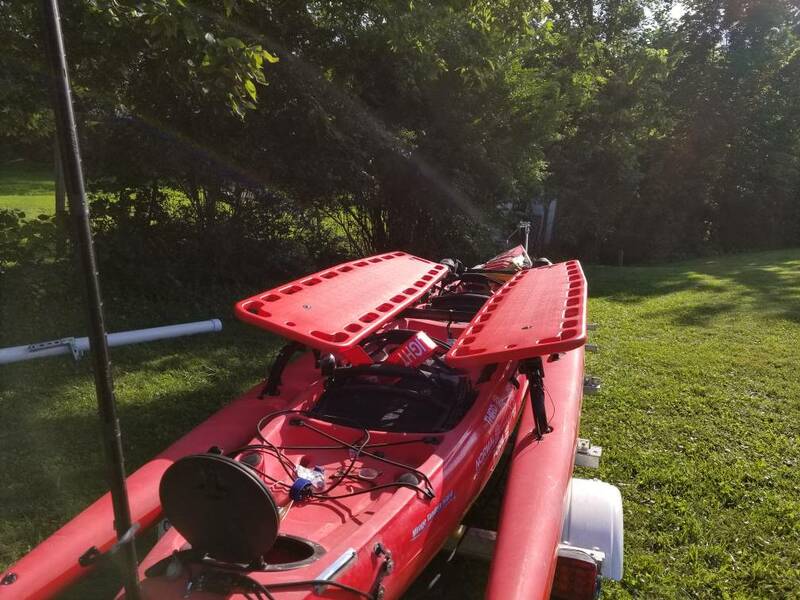 Unfortunately my banker (wife) tells me that I have to save up some more cash before I can order the boards. Bugger! So it will be a few months before I can try this out. I made a set of Hakas over the weekend. To use with Tramps, I made a big J-shaped hook out of 4" diameter PVC pipe 8" long, cut once parallel to the direction of the pipe and softened up with a heat gun. Hand-formed (with welding gloves) until it changed from an "O" to a "J"shape. These are screwed into the front of the haka and hook under the front of the tramp. 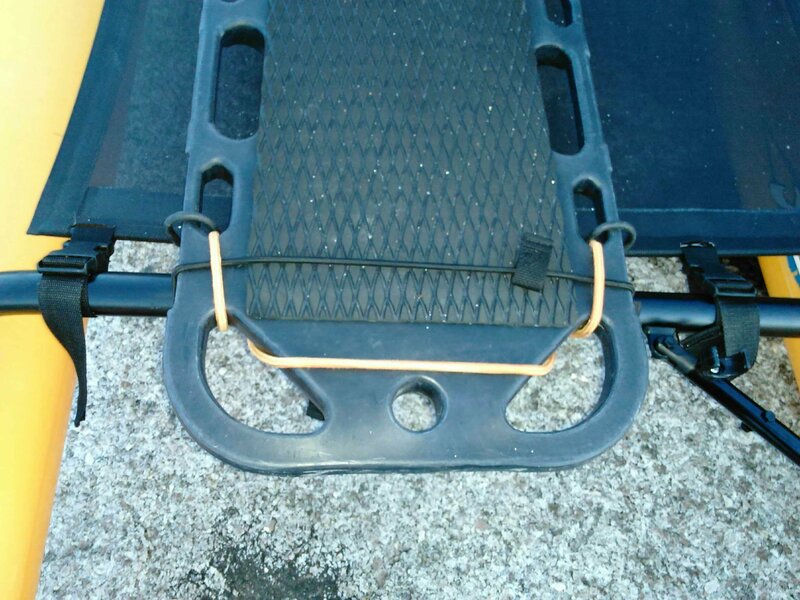 By sheer luck, the holes in the rear of the spineboard line up with the buckles on the rear of the tramp, so I threaded the tramp straps under the rear aka and over the pins then reinforced with a short camstrap. I'm new at posting, so I don't know how to put pictures directly into the post. If someone will tell me, I will post. They look like they were made by an amateur for a reason. They really improve the way the boat sails and keep my wife much drier! Great job with those spineboards Bryan! 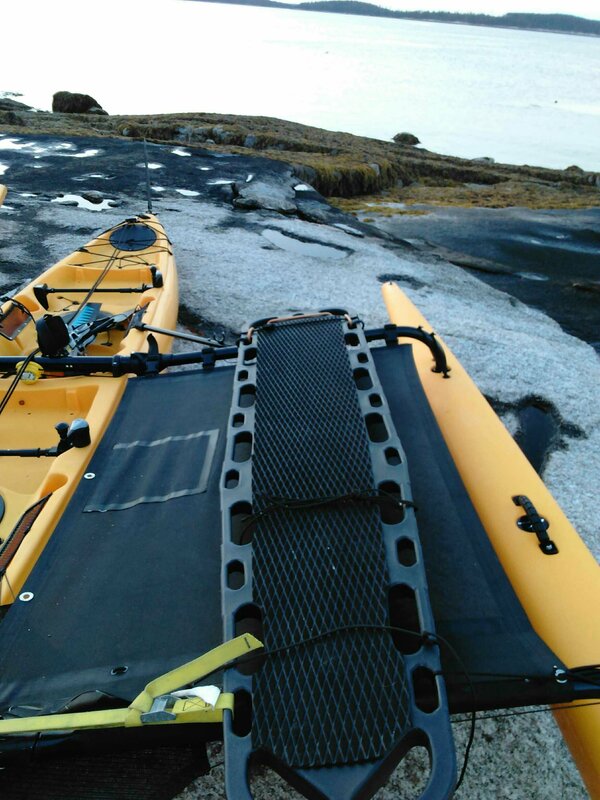 I like the foam padding and all those handholds you get with a spineboard. Are they a dished spineboard and is there much sag when hiked out in the middle? Also what was the finished weight? That location looks ideal for TI exploring/sailing. Last first, they're heavy. I haven't weighed em cause I don't wanna know, but they perform so well in every other way. Low flex (a little more than reinforced Wood ones) salt water resistant, easy on easy off, excellent tie down possibilities. My link is to the super flat spine board, but it needs the rubber applied cause it is slick as crap. 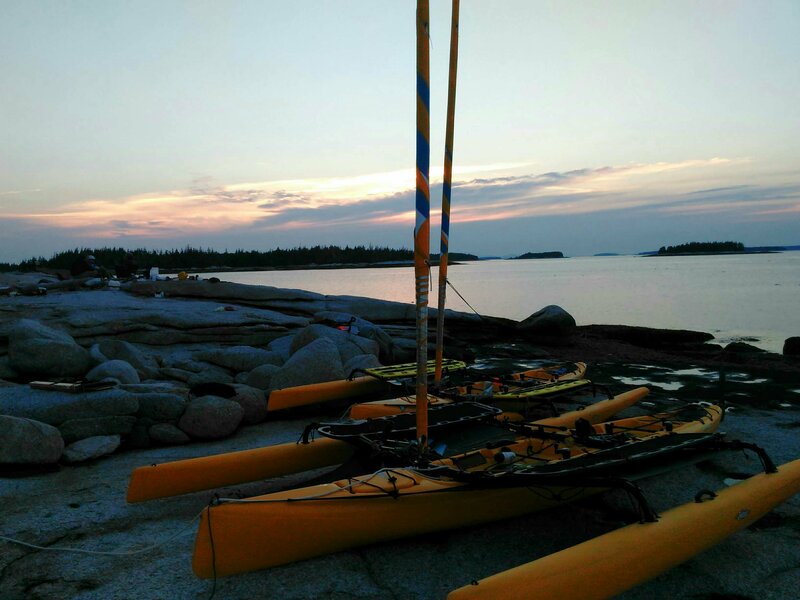 Took this picture as I typed this..Wheat Island, near deer Isle Maine. Hi bedmonds: I got backboards too, and am looking for a good way to attach the front over the trampoline. How did you do it? Ok. Finally got around to getting my spine board hakas mounted. 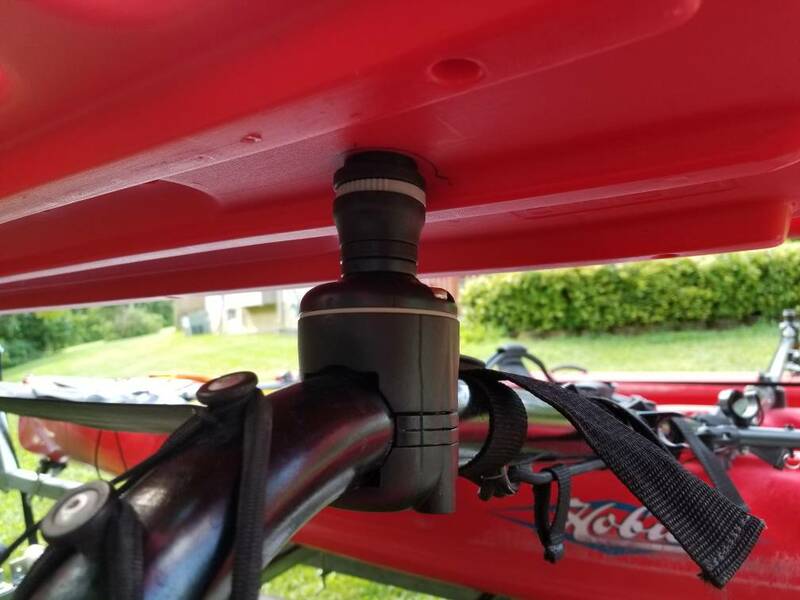 I used Railblaza aka mounts, Railblaza rotating mounts, and Railblaza adapters. I had to go to Ace to get longer screws and I switched everything to standard vs. metric because it was easier to find. I still need to engineer PVC supports that will snap on/off. They fold up nicely.